Robert Boston of Hickory, North Carolina, father of former Kyle Bush Motorsport racer Justin Boston, was convicted of crimes related to fraudulent theft of funds from his company’s investors in order to buy himself an expensive home, pricey cars, and fund his son’s NASCAR Trucks career. Sentencing will happen at a later date, but the elder Boston could head to jail for wire fraud, securities fraud, money laundering, or a combination of all three. At the height of his ill-gotten wealth, Robert Boston contemplated buying his own island, prosecutors say. He diverted $6.1 million of company money so his son Justin could race cars and trucks. Robert also spent millions paying off previous debt, buying a private plane, a Corvette, a Grand Cherokee, and box seats to watch the North Carolina Panthers play. At the height of the fraud, Boston was allegedly attempting to purchase an island. Boston and his partner Robert LaBarge had secured the money ostensibly as investment in an electronics waste recycling firm, called Zloop. The company was founded in 2012, and they immediately began selling franchises the same year. When investors demanded a return on investment in 2013, Boston bilked his way into a $14 million line of bank credit to pay them off. More money was allegedly spent on racing than Zloop earned throughout the course of its operations. When the gravy train came to an end, Justin was dropped from his ride at KBM when Zloop allegedly missed a $650,000 sponsorship payment to the team. Since then, Busch’s team has been involved in lawsuits with Justin, Robert, and Zloop over the failure to meet contract stipulations. 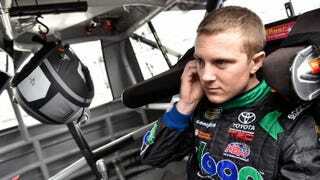 In October, Justin Boston was ordered by a jury to pay Kyle Busch Motorsports over $450,000. It is not inexpensive to make a run in NASCAR, even in the lower tier categories. It becomes a whole lot more expensive when you’re using stolen funds to do so, and you get caught. There is a long history of criminally funded racing efforts, but this has to be one of the dumbest schemes we’ve ever heard.